VANCOUVER, BRITISH COLUMBIA--(Marketwired - March 17, 2014) - Skyharbour Resources Ltd. (TSX VENTURE:SYH)(PINKSHEETS:SYHBF) ("Skyharbour") is pleased to announce that the Western Athabasca Syndicate (the "Syndicate") has commenced its inaugural diamond-drilling program on its flagship Preston Uranium Property (the "Property") in the southwest Athabasca Basin. Three initial target areas, out of a growing target base currently standing at fifteen, were selected by the Syndicate's Technical Committee for immediate drilling based on encouraging fieldwork results and coincident anomalies from ground gravity, airborne and ground EM and magnetics (graphitic conductors and structures), radon, soil, biogeochem, lake sediment, and geological mapping surveys. This drill campaign represents the first modern-day drill exploration program on the Preston Uranium Property. Approximately 2,000 metres of drilling by way of 10 to 15 holes with depths of 100 - 250 metres is expected to be completed at the Swoosh, CHA and Fin South areas during the current campaign. Based on regional data compilation, depth to the top of the target zone (top of basement rock) is expected to be relatively shallow, ranging from 25 metres to 75 metres across the three initial target areas. 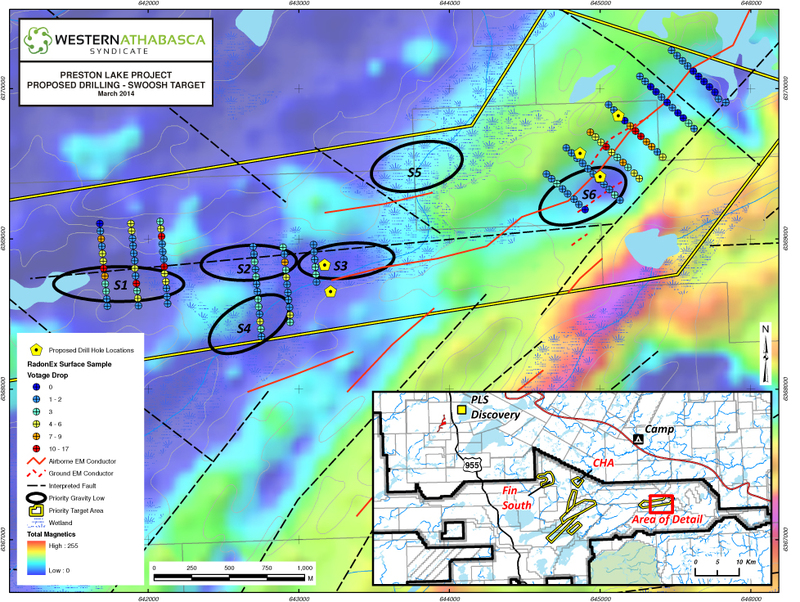 In addition to the Swoosh target area, the CHA and Fin South drill targets also represent high-potential exploration prospects given the presence of coincident anomalies and indicators similar to those seen at the Swoosh target and at other discovery areas in the Athabasca Basin. Preliminary drilling at both these two target areas is incorporated into the current design of the drill program. Management cautions, mineralization present on proximal properties is not necessarily indicative of mineralization on the Syndicate's Property. Jordan Trimble, President and CEO of Skyharbour Resources, states: "The commencement of our first diamond drill program at Preston is a key milestone for Skyharbour and the Syndicate. The findings from the extensive fieldwork carried out to date have greatly exceeded our expectations and have vectored in on fifteen high-priority areas with similar geological features and exploratory indicators as those at the nearby PLS and NexGen discoveries. The three targets we are initially drill testing provide strong discovery potential as we continue to value-add the project using a systemic and proven exploration methodology." 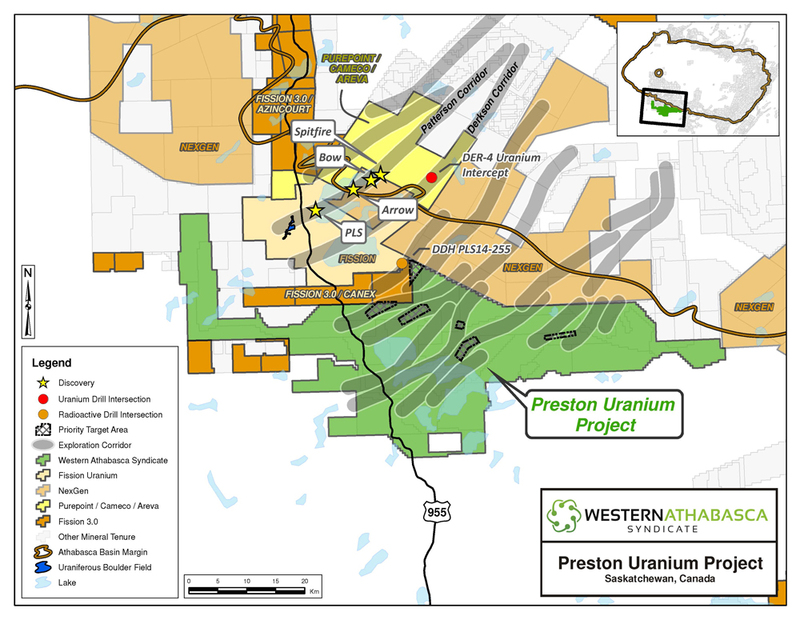 The 246,643 hectare Preston Uranium Property is the largest individual property proximal to Fission Uranium Corp.'s Patterson Lake South ("PLS") high-grade uranium discovery and the recent discovery made by NexGen Energy on the Rook 1 Project (see NexGen's news release dated Feb. 19, 2014). The Syndicate is the largest land tenure holder in the southwest Athabasca Basin region including properties strategically situated to the southwest and to the northeast of the PLS and NexGen discoveries. Skyharbour Resources Ltd. is a uranium exploration company and a member of the Western Athabasca Syndicate which controls a large, geologically prospective land package consisting of five properties (287,130 hectares or 709,513 acres) in the Athabasca Basin of Saskatchewan. $6,000,000 in combined exploration expenditures over the next two years is planned on these properties, $5,000,000 of which is being funded by the three partner companies. Skyharbour also owns a 60% interest in the Mann Lake Uranium project on the east side of the Basin strategically located 25 km southwest of Cameco's McArthur River Mine. The Company has 44.8 million shares outstanding with insiders owning over 25% of the outstanding shares. Skyharbour's goal is to maximize shareholder value through new mineral discoveries, committed long-term partnerships, and the advancement of exploration projects in geopolitically favourable jurisdictions.